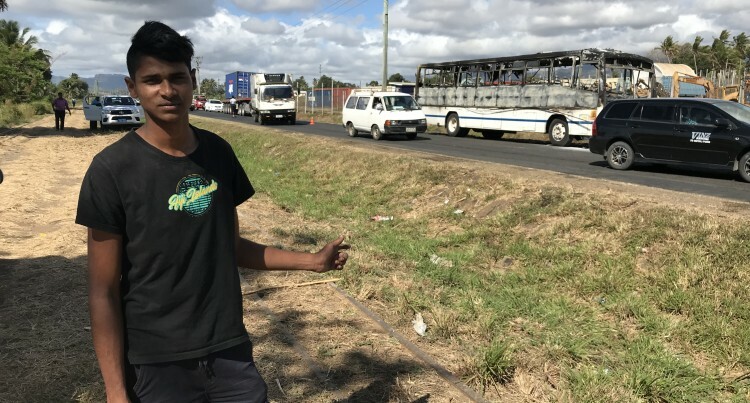 Navneel Rai, 18, was travelling in the bus just like every other day, but yesterday he was caught by surprise when the unexpected unfolded. The bus he was travelling in caught fire at Lovu in Lautoka. As the event turned out to be a life and death situation, Mr Rai managed to get out harm’s way safely. “I saw smoke coming out of the gear box because I was seated right next to it—on the first seat behind the driver,” Mr Rai said. It was around 2pm when the incident occurred. In the bus, he said there was about 40 passengers and they started to show panic when smoke started to engulf the bus. “The fire immediately started spreading to other compartments of the bus,” he said. “So the driver parked the bus safely on the side of the road and people in their bid for safety started disembarking . “People were jumping out of the windows. Some used the main entrance. This was when the courage in Mr Rai came to the forefront as he first rescued the driver from his seat. “The thick smoke had gotten a hold of him and he lost consciousness as a result,” Mr Rai said. “He (bus driver) could not see anything because of the thick smoke,” Mr Rai said. “So I got the driver to safety. He would have suffered burns if I hadn’t helped him. “It got difficult for me to breathe properly. “A woman sustained minor injuries as she was being helped to a secure place. They later took her to hospital. Members of the Lovu community also described the dreadful scenes after seeing thick smoke from the bus fire billow skywards. Police spokesperson Ana Naisoro confirmed that a fire had occurred in the Fiji Transport Bus just outside Lovu. Ms Naisoro said that there had been 40 passengers on board and there were zero causalities except for one who sustained minor injuries.